Stanford, California, USA. The Cognitive & Neurobiological Imaging Center accommodates a 3 tesla research fMRI in the basement of Jordan Hall. Jordan hall is a 5-story 19th-century building on Stanford's Main Quad. The purpose of the facility is for imaging the brains of research subjects while responding to various stimuli. 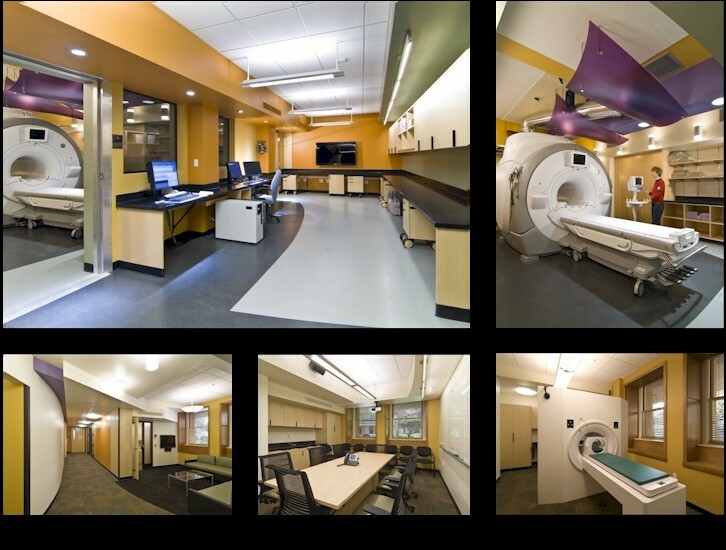 The MRI suite includes offices for researchers and technicians, prep and testing rooms, a conference room, as well as the magnet room, control room and equipment room. A design priority was to make a welcoming, non-threatening, non-clinical atmosphere that will not be stressful to children who are the subject of much of the research. The project includes magnetic and RF shielding, a new transformer and electrical service for the building. The project was completed in December 2010.